Over the past few months, a senior at Eugene Ashley High School in Wilmington has used her senior project as an opportunity to focus on marine science education in schools, with a special focus on underserved audiences. Rachel Piedmont completed her internship with the North Carolina Coastal Federation in April. Piedmont joins the federation from the Marine Science Academy program that was developed by Sandie Cecelski, a teacher and board member for the federation. Piedmont chose to intern with the Wrightsville Beach office after participating in events with the federation through the Marine Science Academy, which gives students the opportunity to dive deeper into the marine science field. Piedmont talks about oysters at Family Science Day at the aquarium. Piedmont helped with an in-school oyster dissection program at Lake Forest Academy and an in-school touch tank program at Sunset Park Elementary School. 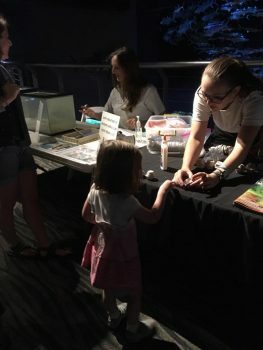 She also engaged visitors with information on the importance of oysters and their role in improving water quality during Family Science Day, a community outreach event at the North Carolina Aquarium at Fort Fisher. As part of the federation’s ongoing partnership with the Blue Ribbon Commission for the Prevention of Youth Violence (BRC), Piedmont taught students about stormwater runoff and also helped students weed, spread mulch and plant native plants in the federation’s rain gardens during the after-school program. BRC provides after-school and summer opportunities for students in the Youth Enrichment Zone (YEZ), which is an area with historically high crime rates and gang violence, located in the north side of downtown Wilmington. The federation received a grant from the State Farm Youth Advisory Board to work with BRC and several Title I New Hanover County Schools on coastal restoration and education activities. Nina Quaratella, AmeriCorps member for the federation’s Wrightsville Beach office who mentored Piedmont during her internship, praised Piedmont’s ability to “jump into situations” as well as her confidence. “Rachel was an exceptional worker, and we are happy that we were able to utilize her skills and provide her with new experiences in the field of marine science education, especially with a focus on underserved audiences,” Quaratella said. Piedmont said during her time at the federation, she has gained greater insight into preservation, education and how she can have an influence on protecting coastal habitats. Volunteering with the federation, which she said she always looks forward to, helped her with her college decision as well. Piedmont plans to attend the University of North Carolina at Wilmington, where she said she wants to continue to stay involved in the federation’s work. “One thing I can honestly say about working with the federation is that no matter where you are or what you’re doing, you are always having fun,” she said.